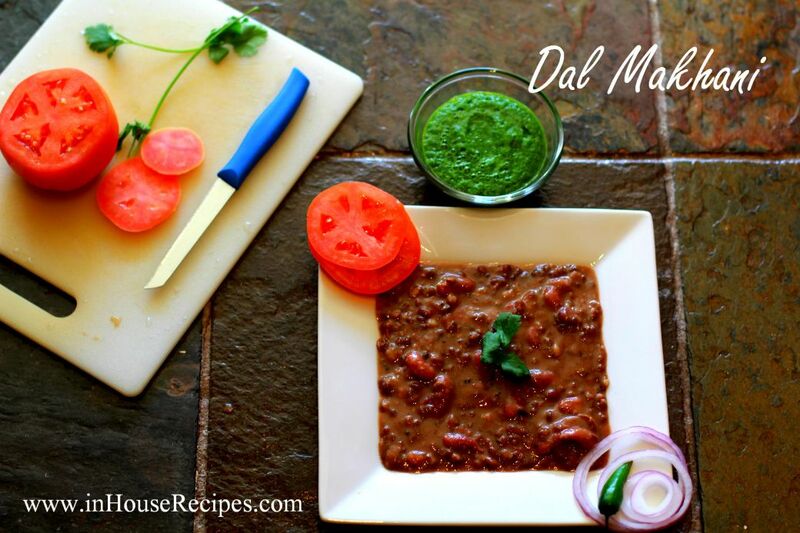 Dal Makhani needs no introduction but I am using this space to just say two words about it. It is a main dish in almost all North-Indian menus especially if you are dining out at any highway dhaba. It is primarily a Punjabi dish but we have made it without onion and garlic. Don't worry, the taste is still the same!! We have garnished it with coriander leaves in the video but you can also use cream to add more flavor and weight to its fat content! Soak the Black Urad Dal and Kidney beans over-night or for 6 hours in 1+1/2 Liter Water. Soak them in separate bowls with each having 750 ml water. Next day or after 6 hours, add soaked dal and Kidney Beans together in a pressure cooker. You should pour in the water as well. Now add Star Anise, Cinnamon, Cardamom, Cloves, Ginger, Green Chilies and 1 Tbsp of Oil with Salt. Cover the lid of the Cooker and switch ON the stove on high flame. let it take 4 whistles. After 4 whistles, turn the stove to low flame and let it boil for 30 minutes. After 30 minutes, keep it aside to cool down. Do not take off the steam present in the cooker. Let it vanish on its own. Once done, open the lid and take out the whole spices like Cardamom, Cloves, Cinnamon and Star Anise. Keep the cooker aside along with boiled dal in it. Melt the butter in a frying pan on high flame. Once Butter melts, turn the stove to medium flame. Add Tomato puree, Red chili powder and Garam Masala Read home made Garam Masala recipe. Cook them for about 4 minutes. After 4 minutes, this tomato paste has become tadka. Switch off the stove and pour the tadka in boiled Dal waiting in pressure cooker. Cover the lid of the cooker. Switch ON the stove for cooker. Wait for 2 whistles on high flame. After 2 whistles, turn the stove on low flame. Let it cook for 30 minutes again. After 30 minutes, switch off the stove. Do not take off the steam present in the cooker. Let it vanish on its own. Once all the steam is vanished, open the lid and mash the Dal with the help of a spatula. This will help to get the thickness in Makhani Dal. 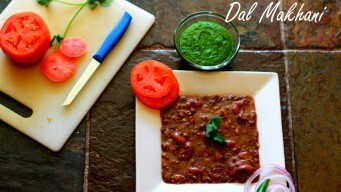 Dal Makhani is ready to serve. Garnish it with Chopped Coriander Leaves. Isn’t it easy? Some people like to eat the creamy Dal Makhani. If you are one of them, you can add the cream or its substitute Malai before serving. The cream/malai is a kind of garnishing which is added on top of Dal Makhani. This would certainly make it heavier in terms of calories and taste! Dal can be refrigerated for up-to 2-3 days for best results. After 3 days, the dal would not be suitable for consumption. Re-heat the dal in Microwave before serving.